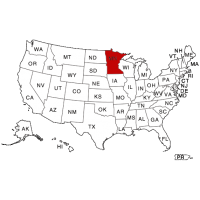 Criminal background checks in Minnesota typically rely on a National Database search, and County Criminal Reports when needed. One great benefit to Minnesota employers is that the Minnesota Court System is very reliable with reporting their criminal record data to national databases. This means that most employers can keep their pre-employment background screening costs at a minimum, and also receive instant results for almost every candidate. In the event that a County Criminal Report is needed, Intelifi sends court researchers to every single county in Minnesota on a daily basis to perform record checks. This is how you can obtain information that is very recent and may not have yet been reported up to the state court system. Intelifi can create a custom package to suit your specific needs. In Minnesota, Felony and Misdemeanor convictions are reported. These can range from severe offenses such as Forgery, to less serious crimes like Reckless Driving. To begin comprehensive pre-employment screening in Minnesota, contact Intelifi today to speak to one of our account representatives.